GoSafe Drive is designed for secure sharing of information considered to be known only to few people within the organization (close User Groups). GoSafe Drive is also suitable for protecting personal data, financial data and other privacy related information. GoSafe Drive works as a normal drive and you can even install your accounting software in it and keep all accounting data in a music or video file. With Google drive desktop application uses can synchronize the file and at the same time mount it as a drive locally and use it like any other physical drive (flash drive / pen drive). 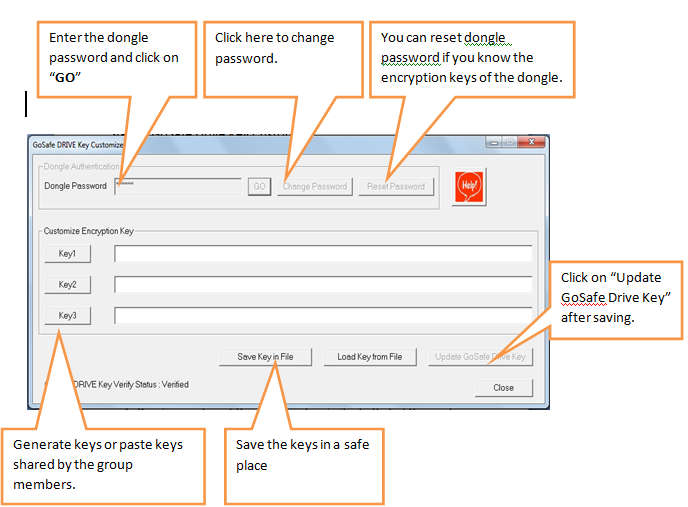 Here is a brief guide on how to use GoSafe Drive and GoSafe Drive Key Customizer. GoSafe DRIVE File Protection uses very strong AES 256 encryption mechanism. Insert your GoSafe Drive dongle. Open GoSafe Drive key Customizer tool/software. Enter the Dongle password, this is admin password, by default the password is 123456, so make sure that you change the password by clicking on €Change password. Enter the changed password and click on GO. You can reset your password if you have the encryption keys, click on Reset Password and load the encryption key, enter the new password and click OK.
Now click on key 1, key 2, key 3, or copy the required keys of existing groups, save the keys in a safe place and click on Update GoSafe Drive Key. For each dongle you have three keys and hence you can create three encrypted groups. Share the key between your group members, Ask the remaining group users to copy the same key, while creating keys in GoSafe Key Customizer as key1 or key2 or key3, they can use remaining two keys for two other groups. Once you change the keys in dongle you cannot read/write the data encrypted with previous keys. You can generate a lost dongle by loading the same keys which were used to create the dongle into a new dongle. You can change the dongle keys any number of times (about 1000) times. 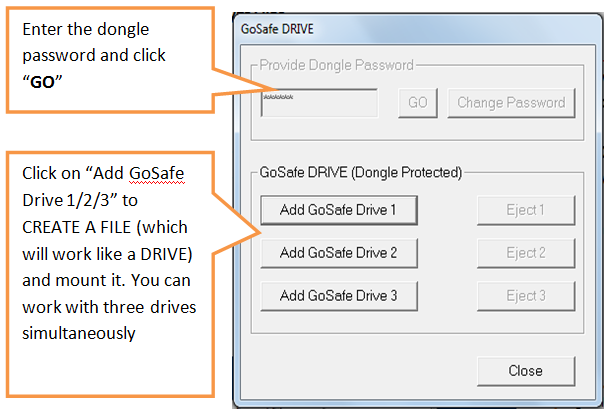 Connect GoSafe Drive dongle, Open GoSafe Drive, Enter password and click OK. Click on Add GoSafe Drive 1. By default the file will be assigned “.gosafe” extension. You can have any other extension of your choice like .mp3, .mp4, .avi etc and click on Open. Now select the group, if you select group 1, then your files are encrypted using key1, similarly for group 2, key 2 will be used and for group 3, key3 will be used. So file will be mountable as a drive using any dongle having the same key (any of three keys in the dongle can match). 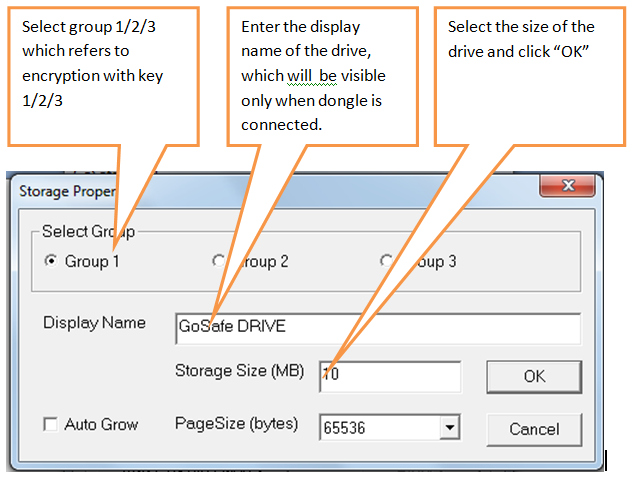 The Display Name will be your drive name and it will be displayed when drive is visible (or mounted) so give a name which is more appropriate to identify the data in the drive. Select the size of the drive. Page Size by default is good, this can be changed by you if you have advanced knowledge of how page size works with drive formatting and other parameters of the system. 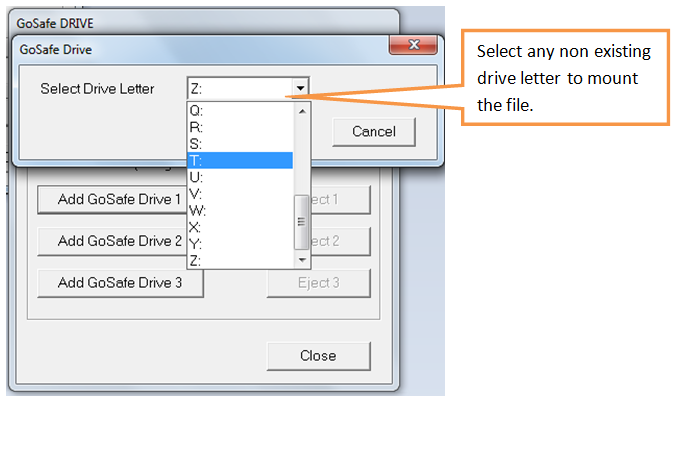 Click OK, Select any drive letter. Similarly you can create two more drives at a time. 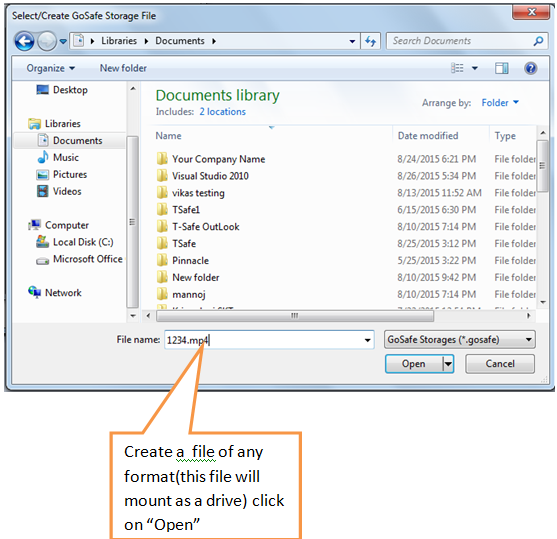 You can also mount an existing file created previously using same buttons. The file you created will mount as a drive and now you can add your confidential data in the drive. Share the file between your group members, by external devices, emails, Google drive, iCloud. The persons which whom you are sharing should have GoSafe Drive dongles with the same key as used by you for encryption or creating file. 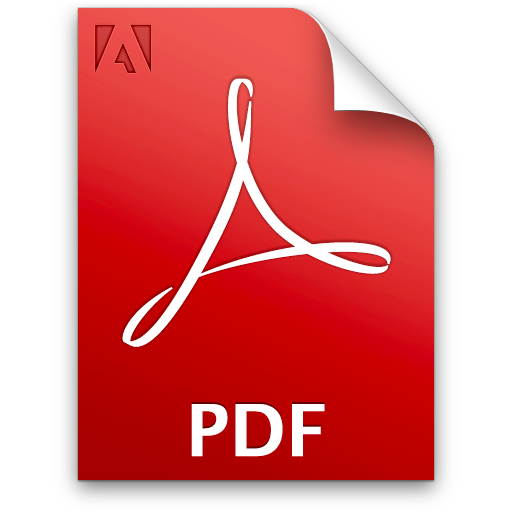 Note:Â Download the pdf help file in Download section below. Go through the below link for secure sharing of data over Google Drive.